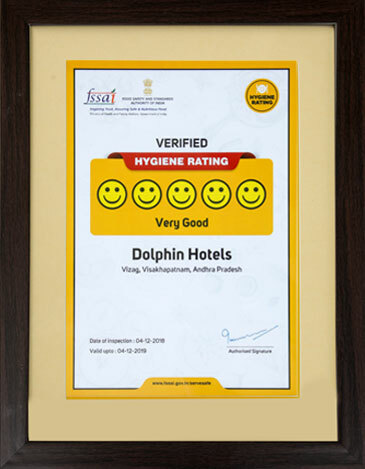 The Dolphin Group of Hotels brings to you a wide selection of rooms/suites designed with the exclusive intention of pampering guests by providing elegant and comfortable rooms. Well-designed interiors, a pleasing ambience and the most indulgent service - these are all dedicated to make your stay here an exceptionally pleasurable experience.The 151 - room hotel comprises rooms in four different categories - Executive, Premium, Deluxe Suite and the Executive Suite. Of these, 139 are double rooms and 6 are Suites. Of the 7 floors, one has been designed completely with non-carpeted rooms, to cater to guests preferring the same. There are 84 rooms in the Executive category. There are 61 rooms in the Premium category. There are 4 Deluxe Suites. There are 2 Executive Suites.